This truss podium is perfect for your conference room, lecture hall or convention center. 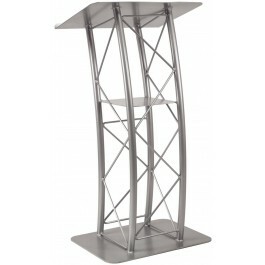 The curved body and light gray powder coat give this box truss lectern modern industrial style. The top platform measures 23.5"w x 17"d, enough room for an open 3-ring binder and the 1" lip keeps notes from sliding off the angled surface. An 10-1/2" x 10-1/2" shelf is welded between the four tubes 26.75" from the base. This is a perfect place to store notes and handouts or that needed glass of water during a presentation. The aluminum truss construction means this podium weighs just 44lbs.